LOS ANGELES, CA – (The Comedy News) – Due to the expected high turnout of Wisconsinites and Texans for the Rose Bowl this weekend, all the bars in the greater Los Angeles area anticipate completely running out of beer by 7:22 PM (PST) on December 31st. “The owners of the more than three-thousand bars, taverns, and clubs throughout Los Angeles are pretty nervous about what will happen on New Year's Eve when all of our beer taps run dry,” said Lyle Gonzales-Moore, spokesman for the Southern California Tavern Association. To accommodate the beer-thirsty fans when the taps run dry, the California National Guardsmen have been instructed to distribute expensive wine and cheese from Northern California to all Southern Californian bars, taverns, and clubs. 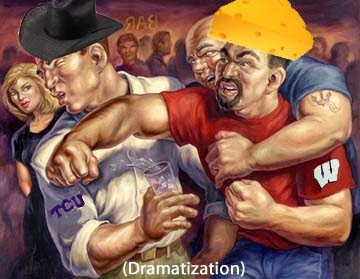 The wine and cheese is expected to quell the nerves of the sobering masses of Badger and Horned Frog fans. City officials also hope that the wine and cheese will bring a little bit of NorCal class to the SoCal visitors during their inevitable riots.